Deal Book. Our bread company, the Canada Bread Company Limited, is up for sale or taking offers. It’s 90% owned by Maple Leaf Foods Incorporated (Reuters, October 21, 2013, Canada’s Maple Leaf explores sale of Canada Bread stake) which seems to be in the process of re-inventing itself following the sale of its Rothsay rendering business to Darling International (of Texas in a deal which should close this month) and its commercial turkey farms, hatchery operation and breeding farms to two Ontario-based companies (The Canadian Press, October 19, 2013, Maple Leaf Foods stock jumps on bakery business review, including possible sale). 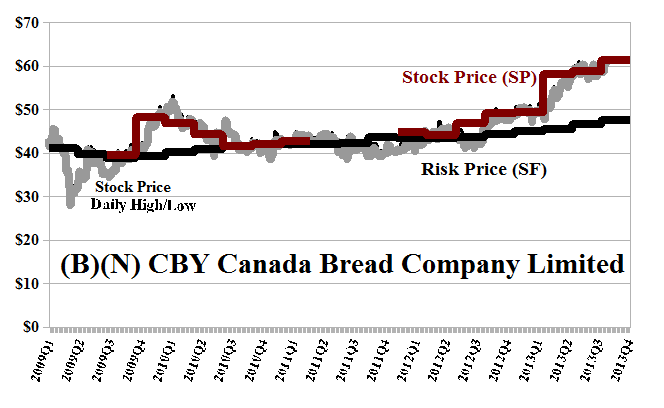 The “enterprise value” (simplified to the shareholders equity plus the market value in these examples) of the Canada Bread Company is $2.3 billion which is 50% above the current market value of $1.6 billion and nearly twice the current risk-adjusted price of $1.2 billion, all of which prices were defied by this year’s purchase of the H.J. Heinz Company at only 50% above the price of risk and 25% above the market value at the time the deal was announced and, similarly, for Verizon’s apparently expensive (but maybe not) purchase of its self that it didn’t own from Vodafone ($130 billion) and Shuanghui International Holdings Limited purchase of Smithfield Foods ($4.7 billion) this year. Based only on the deals that we’ve looked at this year in these Posts, it seems like a PE-multiple of 20× or a 5% yield on the selling price is the magic number for the price of ownership. Please see the “Sold For” line in Exhibit 1 below. Both of these companies have been in the Perpetual Bond™ for several years (please see Exhibit 2 and 3 below) and now we’re going to be paid twice: first for selling our bread-company stock at the acquisition price, whatever that will be although it’s hard to argue for more than today’s price, and then as a dividend from the meat-company stock (ibid, Reuters). 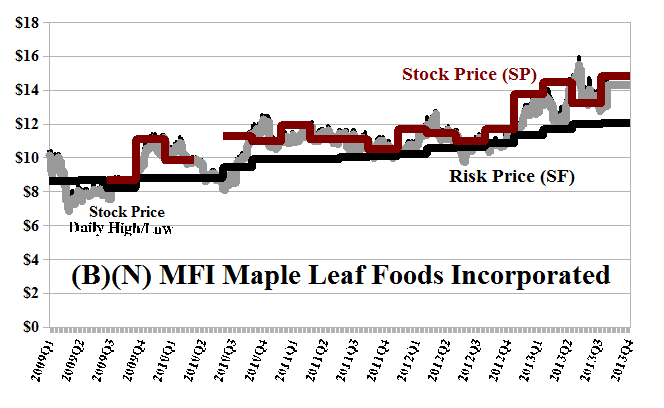 Moreover, we don’t know when, if or how the deal can be completed, but we note that the April 2014 put on Maple Leaf Foods at $14 is still available for $0.85 per share today. Let’s hear it for the foodies out there, although we note that there could be a subsequent takeover offer for Maple Leaf, which after selling the Canada Bread Company will be less than half itself, and makes a short position risky; at least with the put, we limit our possible losses which we can pay for with a few crumbs, so to speak, from Canada Bread at $61 per share. It’s food for thought and it causes us to wonder why anyone would say that the stock market is risky? Possibly they are expecting too much for too little. To see what else risk-averse investing has done for this year, please some of the references below. Canada Bread Company Limited and its subsidiaries are manufacturer and marketer of value-added flour-based products. It engages in manufacturing and sale of bakery and pasta products, including fresh bread, rolls, bagels and par-baked bread. From the Company: Canada Bread Company Limited engages in the manufacture and distribution of fresh and frozen bakery products, and specialty breads primarily in Canada and the United States. The company operates in two segments, Fresh Bakery and Frozen Bakery. The Fresh Bakery segment produces fresh bakery products, specialty fresh pasta and sauces, and fresh prepared foods. Its products include fresh breads and rolls, specialty bakery products, snack cakes, and sweet goods. This segment sells its products under the Dempsters, POM, Bens, and McGavins brand names; and pasta and sauce products under the Olivieri brand name. The Frozen Bakery segment provides frozen par-baked breads, rolls, baguettes, specialty rye and hearth breads, artisan breads, croissants, sourdough breads, scones, pastry shells, and turnovers and fruit bites. It offers its products under the California Goldminer, Sourdough Bread, Grace, artisan breads, Maison Cousin, crusty breads and Tenderflake, and frozen pie/pastry shells brand names. Canada Bread Company Limited offers its products to retail grocery store chains, retail outlets, and the food service industry. The company has 6,400 employees and is headquartered in Etobicoke, Canada. As of March 25, 2013, Canada Bread Company Limited operates as a subsidiary of Maple Leaf Foods Inc. Maple Leaf Foods Incorporated operates as a meat, meals, and bakery company in Canada, the United States, Europe, and Asia. The company operates through three segments: Meat Products Group, Agribusiness Group, and Bakery Products Group. From the Company: Maple Leaf Foods Incorporated operates as a meats, meals, and bakery company in Canada, the United States, Europe, and Asia. The company operates through three segments: Meat Products Group, Agribusiness Group, and Bakery Products Group. The Meat Products Group segment offers value-added processed packaged meats; chilled meal entrees and lunch kits; and fresh pork, poultry, and turkey products. This segment sells its products to retail, foodservice, industrial, and convenience channels primarily under the brand names of Maple Leaf and Schneiders. The Agribusiness Group segment engages in the hog production and animal by-products recycling operations, including biodiesel manufacturing and distribution. The Bakery Products Group segment offers fresh and frozen par-baked bakery products, including breads, rolls, bagels, specialty and artisan breads, sweet goods, and fresh pasta and sauces. This segment sells its products to retail, foodservice, and convenience channels under the brand names of Dempsters, Tenderflake, Olivieri, and New York Bakery Co. The company was incorporated in 1927, has 20,000 employees and is headquartered in Toronto, Canada. For more information on the Chart Elements, please see our recent Post, The RiskWerk Company Glossary. For more on what risk averse investing has done for us this year, please see our recent Posts on The S&P TSX “Hangdog” Market or The Wall Street Put or specialty markets such as The Dow Transports & Utilities or (B)(N) The Woods Are Burning, or for the real class action, La Dolce Vita – Let’s Do Prada! and It’s For You, Dear on the smartphone business. And for more stocks at high prices, The World’s Most Talked About Stocks or Earnings Don’t Matter – NASDAQ 100. For more information on RiskWerk, please follow the Tags or Categories attached to this Letter or simply enter Search for additional references to any term that we have used. Related data may be obtained from us for free in a machine readable format by request to RiskWerk@gmail.com. Investing in the bond and stock markets has become a highly regulated and litigious industry but despite that, there remains only one effective rule and that is caveat emptor or “buyer beware”. Nothing that we say should be construed by any person as advice or a recommendation to buy, sell, hold or avoid the common stock or bonds of any public company at any time for any purpose. That is the law and we fully support and respect that law and regulation in every jurisdiction without exception and without qualification to the best of our knowledge and ability. We can only tell you what we do and why we do it or have done it and we know nothing at all about the future or the future of stock prices of any company nor why they are what they are, now. The author retains all copyrights to his works in this blog and on this website. The Perpetual Bond®™ is a registered trademark and patented technology of The RiskWerk Company and RiskWerk Limited (“Company”) . The Canada Pension Bond®™ and The Medina Bond®™ are registered trademarks or trademarks of the Company as are the words and phrases “Alpha-smart”, “100% Capital Safety”, “100% Liquidity”, ”price of risk”, “risk price”, and the symbols “(B)”, “(N)” and N*.